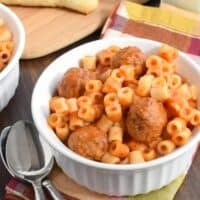 Homemade Spaghettios and Meatballs made in the slow cooker! 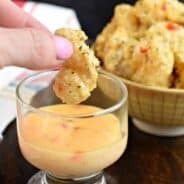 Childhood food that even adults will love! Sometimes I just need comfort food in my life. You know what I’m talking about. For me, comfort food is that which reminds me of home. Whether it be my childhood, my children, family, friends. Life’s moments in our family are often shared around food. Yet, as I’ve gotten older, and my palate has expanded, a can of spaghettios and meatballs just doesn’t taste good to me anymore. I’m not sure that I ever LOVED it, but I definitely spent many meals eating it. My mom would buy cases of them from Aldi or the grocery store, and we kids would eat them for lunches, snacks, dinner. 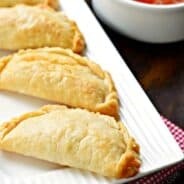 I know I would take some to college with me too (easy to make in the microwave for a quick, filling meal). 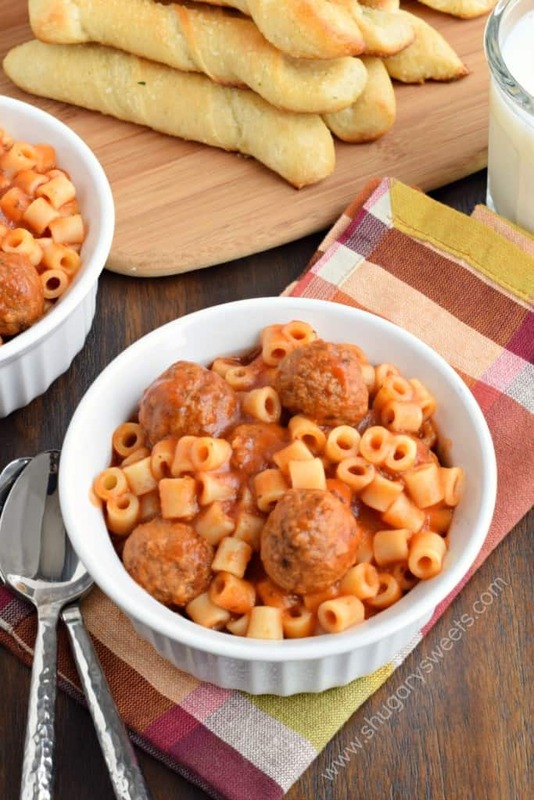 Today, I’ve got a homemade Spaghettios and Meatballs recipe that even adults will enjoy! I used some cooked turkey meatballs (just to lighten things up a bit), and I let them simmer in the crockpot with a homemade sauce. 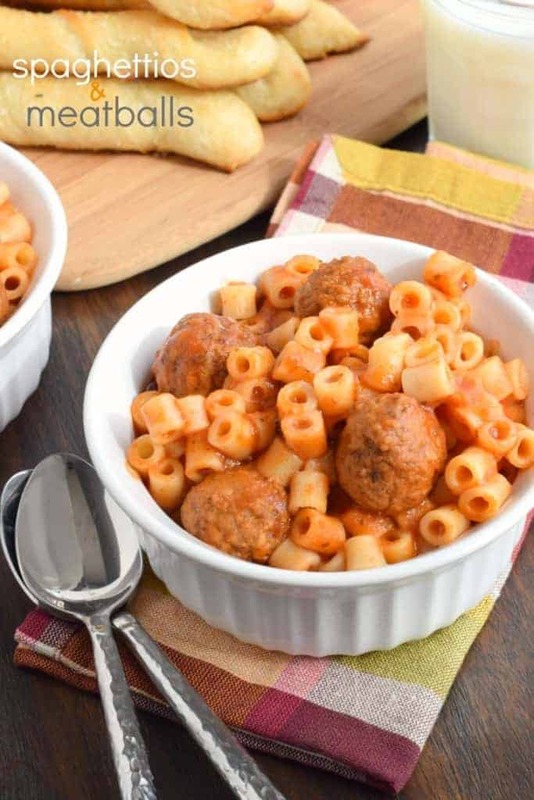 If you prefer, use the frozen meatballs from the grocery store. You don’t even need to thaw them! Cook for about 5-6 hours on low. About a half hour before dinner, I tossed in the ditalini noodles. Not only did they cook, but they absorbed much of the extra liquid in the slow cooker! While the noodles were simmering away, I whipped up a quick batch of Pillsbury breadsticks. I always melt a little butter and add some garlic salt to it. Then brush it on the warm breadsticks and sprinkle with some grated parmesan cheese! I love making meals like this near the end of the week. That way my kids can re-heat this over the weekend for snacking and lunches! Happy Eating! 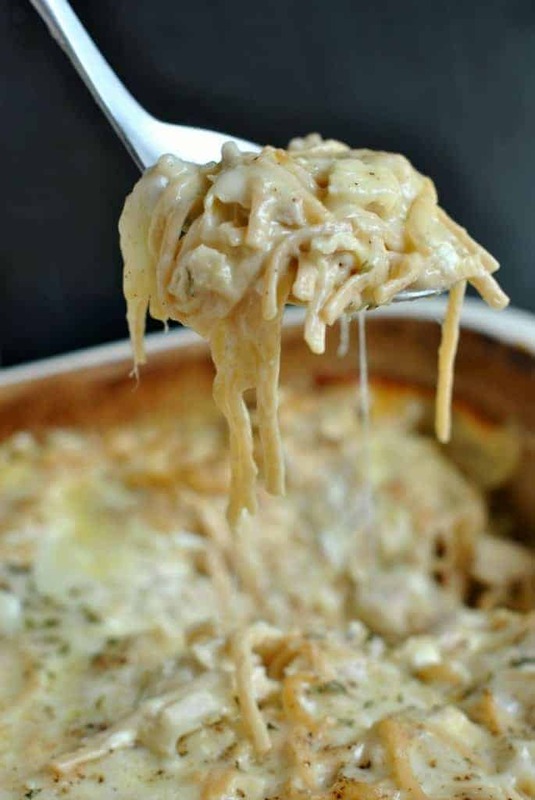 Chicken Tetrazinni: this is a family favorite!! 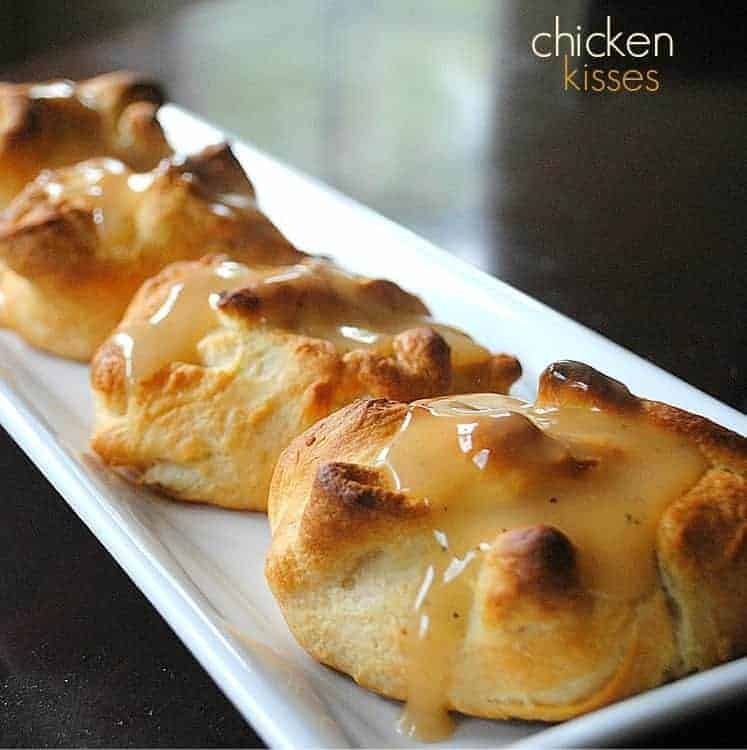 Chicken Kisses: my daughter’s most requested dinner! 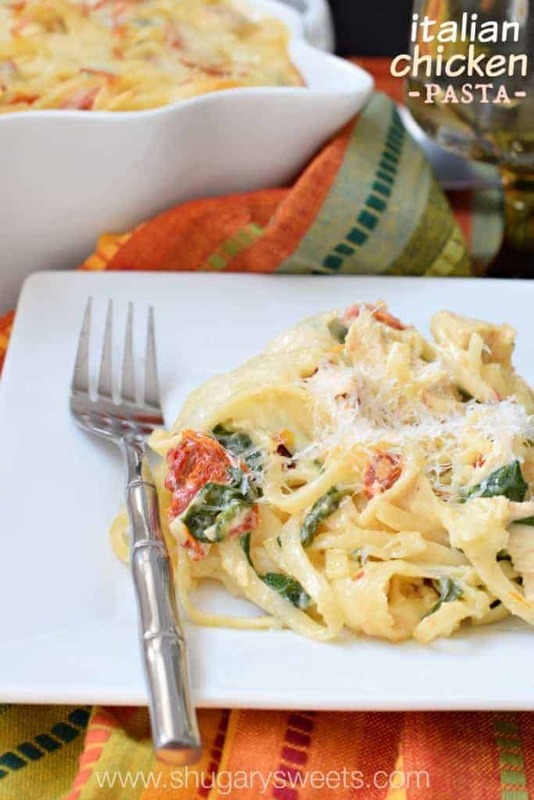 Italian Chicken Pasta: creamy noodles with chicken, spinach and sun dried tomatoes! Making this at the end of the week is SUCH a great idea! I never have anything for the hubs to take to work during the weekend…and that is my NO COOK time! Plus, you can never go wrong with a childhood classic. Pinned! This is such a great idea because you know that kids all over the country love spaghettios! Meatballs are a comfort food for me too! I always make extra to freeze so I can pull out as needed. Great recipe Aimee, as always! This is an awesome meal idea!!! My kids are going to go crazy for it…and I love how easy it is to make!!! We used to buy those canned spaghettios all the time too, and I never was crazy about the taste! I can’t tell you how many meals of Spaghettios I’ve eaten! This looks really good! I hardly eat food out of cans any more because of preservatives but spaghettios where one of my childhood favs! This looks like a great copycat! Pinned. Have a great Wednesday! This brings me back to middle school… I used to eat Spaghettios and meatballs for my school lunches. All my friends got jealous because I was the one with the “cool” lunch. I love that you recreated this! Oh my gosh what a good idea! I know my daughter would love spaghettios but I have never given them to her because I don’t want her to have that much salt. This is perfect! What a fun recipe! This looks AWESOME. 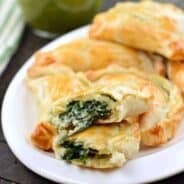 I totally loved Chef Boyardee as a kid and hey, even still as an adult 🙂 But homemade is always better and this looks AMAZING! Love that you used turkey meatballs, too. I’m now craving this! This is PURE comfort food! Definitely for adults and kids — my girl would love this! I used to eat spaghettios all the time too. I never liked it, but it was a simple and quick dinner for my busy working mom. I love that you made your own and then used your slow cooker. Man I need to use my slow cooker more. I am so making this for the kiddos asap. Love those big meatballs and the fact they are turkey makes me one happy mama. Pinned!! I adore homemade meatballs! This looks so good, honestly, its making me so hungry even though I just ate lunch. Delish! Hubby loves spaghettios! He used to make them and put cut up hot dogs in the bowl. haha, we did that growing up too!! I need to make this! When I was a kid, spaghettios were my favorite. I haven’t eaten them in so long! This was very good. Will absolutely make this again. I will lower the Oregano to 1 tsp. Other then that the flavor was perfect. This made with the meatball recipe posted above made for a very happy family tonight. Thank you for sharing. Looks yummy, 40 meatballs. How much meat would you need if you prepared these vs frozen? I too am all about making ahead and freezing. Your meatball recipe will be very versatile will other recipes. I have a cookie scoop which should simply the making of the meatballs. Made this tonight. During the process, I thought, “Too many meatballs! Too much sauce! Not enough pasta!” But I was totally wrong. Exactly the right amount of everything. This was SO good and SO easy. Thanks for a terrific recipe! 🙂 I’m so glad you enjoyed the recipe!!! Is that a total of 15oz of tomato sauce, or 2 15oz cans? Two 15oz cans 🙂 ENJOY! When you say 2 cans of tomato sauce, is it plain with no seasoning? And not a jar? Do you have a specific one you like? It is plain sauce. I am all over the place with what I purchase, but I usually look for a low sodium, or organic option! I’m a little confused, did you cook your homemade meatballs first, then put them in the crock pot or just put them straight into the crockpot to cook? You didn’t specify wether it’s tomatoe sauce goya brand type or spaghetti tomato sauce. I️ just put spaghetti sauce in it and now it probably won’t turn out right ! I was hoping for a good dinner but from the looks of the instructions not being specified about “tomatoe sauce” it won’t turn out. Here is the US…tomato sauce comes in a can and is different than spaghetti sauce. Will be making this tomorrow! FYI…I found little round ‘o’ pasta online from Walmart, Creamette is the brand name. Can’t wait, hoping the g-kids love it!!!! If you add another 15 oz of beef broth and a can of tomato sauce, you can add the uncooked pasta in the slow cooker. Saves the time of having to cook the pasta separately. I just made this last week and it was delicious. I actually found 15 oz cans of Hunt’s Tomato Sauce with Basil, Garlic, and Oregano (instead of just plain tomato sauce) then didn’t have to add additional spices as the recipe calls for. 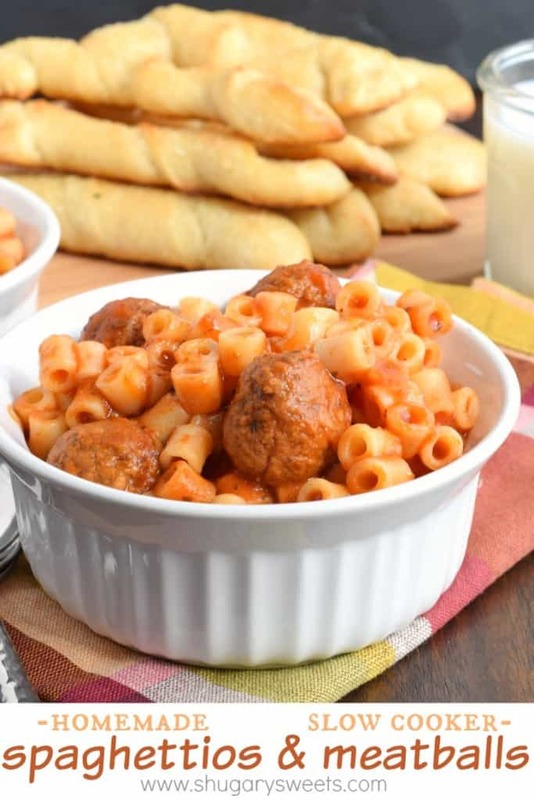 I used a whole bag of frozen meatballs and everything turned out delicious!!! Thank you for the recipe! Sorry, I’m really confused now by the comment from Chelle and your reply. I thought the recipe was written to add the pasta dry, but your comment that it is a great tip has me wondering. Am I supposed to cook the noodles before hand? That seems to defeat the purpose of using the crockpot. Please help I was planning to make this tonight.